Although I’ve been spending time with preschoolers this summer, I frequently think about my middle schoolers (crazy isn’t it?) and the beginning of the academic year in September. Recently, I have been trying to brainstorm potential tools and/or methods I can implement to improve management of my speech groups. In my earlier post I discussed the use of a stopwatch to help students become more independent in their time management abilities. That got me thinking about what can be done to manage students’ loudness. There have been frequent instances where I’ve had to remind excitable groups to “keep it down” or individual students to bring their voices down. One student, lets call him “Dennis”, has a very difficult time judging his vocal volume. Don’t worry, the first thing I checked was to see if he passed his audiological assessment, and indeed, he has. Consequently, his peers tell him to “stop yelling” or on occasion “shut up” (kids can be harsh). This brings me to today’s post. It is a free app called TooLoud? The developers advertise this app as a tool to assist in determining environments that are potentially harmful to your hearing. For a classroom teacher or clinician this provides a great visual that aids in student management of group or individual loudness levels. A numerical value measuring the decibel (dB) is displayed along with a live line graph and sliding bar that indicates the environmental increase/decrease in noise. TooLoud? 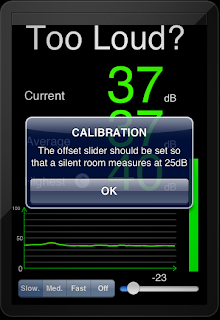 can be calibrated to establish a baseline, as it recommends you set its slider in a room that measures 25dB. Levels of loudness that are deemed “dangerous” or too loud are indicated by a red line graph and bar. Additionally, a warning will appear on the screen. To serve as motivation, I plan on offering a reward to individuals or groups who are able to stay out of the “red” for the duration of their therapy session. TooLoud? can also be used to have students “catch” or point out when their peer is in the red. TooLoud? is available for download to the iPad, iPhone, or iPod touch. For those of you have a projector in your possesion, the iPad can be easily connected and projected onto a screen/wall. Unfortunarely, I have an Android operating system on my phone and am unable to access this app on it. I guess I’ll be using my iPad for now! This was the complaint of my son's teacher this school year, along with "He's in everyone's face", "He touches the students", etc. They did not realize he was a CODA (Child Of Deaf Adult) and for 8 years of his life, I have repeated told him, "Speak up" "Come here so I can see what your lips are saying" "Touch me to get my attention" etc... You get the idea. They went from diagnosing him as special needs, to working with what is acceptable communication with Mom is different with what is acceptable at school and other social gatherings. Sometimes there is more to the story. Great that you are observant to have the child's hearing tested right away! You are right, there is usually more to a story. You actually go me thinking...When the school year starts back up, I will contact this student/parent and inquire as to whether "Dennis" is in the presence of someone who is hard of hearing. Thank you! You're quite welcome! We were asked to come and give presentations to all eight second grade classes on deafness and Sign Language for Helen Keller week.. :-) It helped my son with his friends once they learned "why" he was this way, and they were excited to learn some signs, too. So cool! I can also see how this could be easily adapted to help people INCREASE their volume levels, too. (Could be a great visual aid for people with voice disorders or children with assertiveness difficulties.) Thanks for sharing! Thank you speechie! There are def. a lot of possibilities with this app. I'm so glad it was free!